reduce even a fraction of this would be of great advantage. Financial institutions as well as startups have already begun looking for ways to innovate, and make banking systems more efficient which allows financial institutions to the lending problem effectively. Interestingly, lending can be seen as a big data problem making it naturally suited for machine learning. As part of their strategy to become efficient, profitable new age digital lenders, financial institutions can optimize their lending processes to support proactive loan decisions by leveraging AI-driven advanced analytics. The application does not share personal data with lenders to protect individuals’ privacy but only the final result of their analysis. This has allowed their partners to approve up to 50 percent more applications. Cognitive AI applications which help students pay off their student loans faster uses machine learning to analyze the individual’s financial habits to determine if they can afford to pay back their loans faster, besides also automatically prompting how much more they should contribute. Even with these concerns, the use of machine learning to process alternative data to determine creditworthiness will grow significantly. 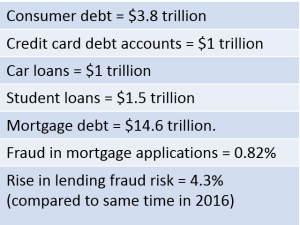 There are billions of people who are unbanked or a disorderly financial spending pattern to whom financial institutions may one day offer mortgages, payment plans for products, credit cards, or other loans. The financial appeal of these tools is obvious. It is reasonable to believe that the more information you gather about an individual, the more likely you would be able to predict their behavior, including how diligently they would pay back a loan.